Click on this and sit there watching the time you are wasting go by. I have been mulling over ACT's scholarship policy which was under attack yesterday. This isn't the vouchers policy but a scheme Heather Roy pushed through as part of the National/ACT agreement. It wasn't campaigned on. She acquired $2.6 million for 150 scholarships for low socio-economic children to attend private schools. The question I have been asking myself is what part of a classical liberal philosophy does the policy satisfy? And if ACT isn't a classical liberal party which other principles does this policy fulfil? Isn't it simply an example of taxpayer money being spent on privilege or special interest? There is certainly an argument that it is a better use of taxpayer than many others but is this the track ACT should be going down? Isn't that what leftists are all the time doing? Harnessing taxpayer money for what they believe in? Personally I would have expected ACT to be encouraging private or charitable enterprises to fund scholarships. If you want a laugh you wouldn't ordinarily go looking for it at The Standard but this is passably funny. Rodger McDaniel, a lawyer, church pastor and former state legislator who is deputy director of the Wyoming Department of Health, reckons that whenever there is fast growth in an economy it brings with it a variety of social problems, including drug use, alcohol abuse and child abuse. That makes sense, for all of those have soared with a vengeance since the economic revolution of the mid-1980s. “This latest report makes it quite clear - the peak in child deaths was from late 1980s and 1990s - the so-called experimental years in New Zealand’s economy - when unemployment was highest and when benefits were cut” says Mrs Turia. Poor old rogernomics. Damned if it did; damned if it didn't. The statistics alone do not support either theory anyway because the death numbers are so low very small differences can substantially change the rate. And any debate about the rate of abuse gets incredibly muddied by changing definitions, changing attitudes and reporting rates, and changing laws and their application. Eight children aged between five weeks and three years died from abuse in the year just ended, which is the average for any year in this country. 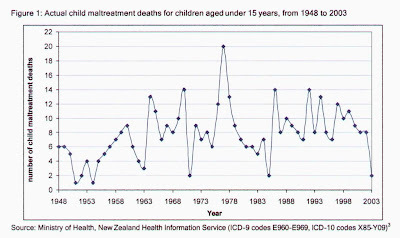 Yet deaths from child maltreatment have averaged around 8 a year for a long time. Then the statist in George goes looking for a quick fix. The Do something, Anything approach. And, perhaps, undo the shocking discrimination instituted by the Clark Government that denies the child-related supplement called the in-work tax credit to the poorest children and has left them further behind and well below the poverty line. Says Susan St John, of the Campaign Against Child Poverty: "It would cost about $450 million a year to extend the in-work tax credit to all low-income children. They would then be treated the same as others regardless of the source of their parents' income - as they do in Australia. "Money is not everything but it is a very important basic foundation. Society deliberately denies the poorest children adequate financial support and then blames them when their children become social costs." Certainly money isn't everything, but for God's sake let us start somewhere - and soon. Unfortunately, to some people, money is everything. Let's strip this thing down. Children are abused, very occasionally to the point of death, because they are not wanted. They are brought into this world oh so casually by people who do not have the maturity to look after a puppy. Why, when avoiding unwanted pregnancy is easier than it has ever been, does it keep happening? Because 'dropping sprogs' is part of a lifestyle. The same lifestyle that involves the drug and alcohol abuse George refers to. It's a mean lifestyle that has always existed. But without a doubt, paying people to not only live it, but add children to it, has exacerbated the incidence. Forget all the crap about slow economy/ fast economy. Like other developed countries, in our 20th century crusade to redistribute wealth - to obliterate need and inequality - we grew this group of disaffected and dysfunctional individuals. And Garth George is calling for more of the same. 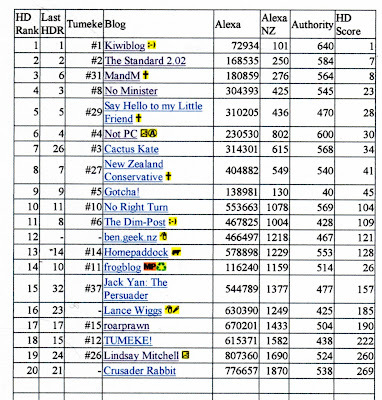 Half Done rated 683 blogs in December 2009. What I can't figure out is what the little yellow icon denotes. The following is from James Bartholemew, author of The Welfare State We Are In. Which NZ government does the opening paragraph remind you of? Hint. National hasn't even talked big - yet. In the great roll call of this government’s failures and blunders, its record on housing benefit deserves to have a prominent place. This was the government that was going to “think the unthinkable” on welfare benefits. Instead it “did the predictable”. Instead of embarking on radical reform like the administration of President Clinton in America, it opted to muddle along. It talked big and acted small. Housing benefit is arguably the worst of all the benefit failures. Why? For two important reasons. One, it costs an amazing amount of money after nearly doubling since Labour came to power to £20 billion. That – for those who can bear the idea – amounts to £692 for every working person in Britain. Most people imagine that Jobseekers’ Allowance is the big, key welfare benefit. Not at all. Housing benefit costs more than three times as much. The second and even more important reason why this failure matters is that housing benefit is probably the biggest single discouragement to the low-skilled unemployed to getting a job. Get a job and you lose housing benefit at a rapid rate. So housing benefit is one of the most important reason why more one in four people of working age are not working. The official cost of £20 billion is just the beginning. Nearly all the people who are discouraged from working are also getting other benefits including Jobseekers’ Allowance and – in many cases - Incapacity Benefit or Income Support. But worse even than that is the effect on the morale and culture of those at the lower end of society who get accustomed to welfare dependency. It causes depression and alienation and contributes to uncivil and even criminal behaviour. There is a simple rule for creating sound welfare benefits. It was described 175 years ago in the report of a Royal Commission into the operation of the poor laws. The commissioners decided that benefits should not be more advantageous than the income that would be obtained by the individual taking on low-paid work. It is as simple as that. Work must always pay. .
On radio phone-ins I have often heard people exclaim: “Do you realise how little you get on Jobseekers’ Allowance? You can’t live on that!” Unfortunately interviewers – being part of the upper middle class - rarely understand that the Jobseekers’ Allowance and other benefits are normally accompanied by other benefits such as a free school meals and, very likely, the big one: housing benefit. Only when they are all added together do they amount to a meaty discouragement to work for the low-paid. It will come as a surprise to many people to know that not all countries pay housing benefit – or at least not to as many classes of people as Britain does. In Italy, for example, an unmarried teenage mother does not climb up the council housing queue, get income support and housing benefit. She is expected to live with her parents or other relatives or perhaps the father of the child. The result is that there is far less unmarried parenting in Italy than here. They make their decisions and live with them. That means they make better decisions. If there were prizes for tinkering with the welfare benefit system, this government would certainly win the gold trophy. I used to get press releases from the old Department of Social Security as it was called. If I had had a strange notion of interior decoration, I could have wall-papered my bedroom with them within a few weeks. To be fair, some reforms have gone in the right direction. James Purnell, when he was in charge, decided that people should only get benefit to pay for a maximum of five bedrooms. Yet you can see from this example just how cautious the reform has been. For people who struggling to afford accommodation with two bedrooms, it will seem outrageous that others can going on having babies and getting more and more bedrooms at the expense of taxpayers. And people sometimes get benefit at a level based on expensive housing. Hence the scandalous case recently of one family getting £2,875 a week. America was far more radical in its reforms. President Clinton agreed to a limit to the total number of years in a lifetime during which people could claim unemployment benefit. America was determined to do something about the benefits culture. Britain under Labour has merely strutted on the stage – posing, pontificating and making precious little difference. What could be done? One idea – from the Centre for Social Justice - is to subsume housing benefit with many benefits into just a couple of major benefits. The benefits could be withdrawn at a slower rate than now when someone gets work, thus reducing the discouragement to getting a job. The trouble is that, other things being equal, this would cost a lot more. The truly radical idea would be do something like that but significantly reduce the amount paid and leave it to the recipient entirely what accommodation is rented – if any. That would provide a powerful incentive to lodge with relatives or to go to a different area with lower rents. But has Britain got the guts to do this sort of thing? I would like to think so but there is every reason to doubt it. The upper middle class elite does not get the seriousness of the problem. The BBC, the readers of Guardian and the Independent believe that their support for generous benefits makes them into generous, good people. Unfortunately it does not. It results instead in the continuance of a welfare dependant lower class with tremendously damaging social effects both to the poor themselves and everyone else. If one in three Maori women is on a benefit, one in two Maori women smoke, and smoking rates are highest among low income groups, the chances are the taxpayer is paying for their cigarettes or rollies. The taxpayer is also paying for their cessation attempts, on average numbering 14 before successful. So we pay for Maori women to smoke, and we pay for them not to. There seems a more obvious solution, although there is little political will to explore it. Quitting smoking is tough. It is doubly tough if you are depressed, bored, idle, with nothing to look forward to and nothing else in your life that gives you pleasure - albeit fleeting pleasure. And when in such a rut the prospect of foreshortening life doesn't hold much sway either. Kiwiblog recently ran a story about a no-smoking prison that was deterring people from committing crime. They would rather give up crime than quit smoking. Given a choice I am sure some people would rather get a job than quit smoking. Such is their desire to smoke. While people have multiple problems in their lives, quitting smoking will never be a priority. There are more fundamental issues that need sorting first. The Australian holiday road toll is 68. The legal minimum driving age is 17. The Australians are blaming the state of their roads and irresponsible driving. In NZ the holiday road toll is currently 11, which is, on a per capita basis, lower than Australia's. New Zealanders are blaming the minimum driving age of 15. NZ and Australia are obsessed with holiday road tolls. Perhaps because it fills a gap in news stories. Perhaps because various interest groups want to use the toll as a lever. But do many more people lose their lives over this particular period? The Christmas/New Year holiday road toll period begins at 4pm on Thursday 24 December and ends at 6am on Tuesday 5 January. The holiday period will be 11.6 days. Last year the 2008/09 holiday period was exactly the same - from Dec 24 to Jan 5 (11.6 days). 11 deaths in 11.6 days is, so far, under the average for that time period. In 2005 New Zealand's road toll was only very slightly above the OECD average. Per 100,000 population, NZ's average was 9.9; OECD 9.5. The NZ figure has improved since. There are a myriad of factors affecting the rate but, in the scheme of things our rate isn't really, really bad - and neither is it really, really good. Accidents, tragic accidents, happen. But, the trend is heading in the right direction - down. I guess I am just tired of being hectored about the road toll, along with smoking, eating junk food, drinking alcohol, water safety, sun safety, ad nauseum. No wonder so many New Zealanders are neurotic nutbars. Best just stay indoors and diet. In an unhappy coincidence, Wellington, the home of hectoring, taxpayer-funded harpies, has served up the weather to make you want to do just that. What happened to Maharey's grand plan? Work and Income will be doing more to help sole parents into work with changes to legislation that comes into effect this month, says Social Services and Employment Minister Steve Maharey. The Social Security (Personal Development and Employment) Amendment Act, which comes into effect on 10 March 2003, delivers on government promises to develop a social security system that responds better to the needs of individuals and their families. “The legislation abolishes the arbitrary work test on sole parents receiving the Domestic Purposes or Widows Benefits. Currently 19% or 21,924 are subjected to a work test requirement to seek part or full-time work because of the age of their youngest child. “As a result of the change all people receiving the DPB, Widows or Emergency Maintenance Allowance will receive enhanced case management to help them in training and work planning for their future. “All 118,098 in the three benefit groups will be required to work with their case manager to develop and implement a Personal Development and Employment Plan. The plan will outline personal development, training and employment goals and the action points required to reach those goals. I asked MSD how many beneficiaries had a PDEP. By June 2009 the grand total was 35,161. Of those 24,096 were on the DPB. Only 23 percent of all DPB recipients. If you are thinking that the policy had been abandoned because of a change in government, hence the low number, you are wrong. 66 percent had been implemented between June 2007 and June 2008 and the remainder over the next 12 months. The interesting thing is that only 17 people on the DPB who had a PDEP had had it put in place 3 or more years ago. Which may indicate that 1/ The plans do motivate people to move off a benefit or 2/ The ministry's record keeping is suspect. If it is the first, no surprise. Around a third of people on the DPB are motivated to get off it. They would probably do so with or without the plan. It is easy for case managers to work with this group. But what about the rest??? At the time of Maharey's press release there were 108,000 on the DPB. Now there are .... 108,000 on the DPB.